At the Nintendo E3 2010 press conference, Shigeru Miyamoto revealed The Legend of Zelda: Skyward Sword, with full 1:1 Wii MotionPlus swordplay. 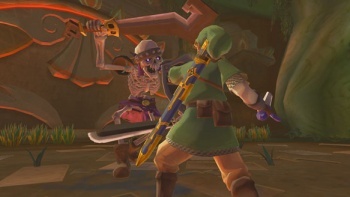 Ever want to play a Zelda game where you swung the Master Sword and Link followed suit? Shigeru Miyamoto took the state at E3 2010 during the Nintendo press conference to announce the latest Zelda: Skyward Sword. Unlike Twilight Princess, which had you flicking the remote to approximate sword swings, Skyward Sword takes advantage of the Wii MotionPlus adapter and the technology for the swordplay in Wii Sports Resort to let you swing in different directions. If an enemy blocks high, swing horizontally - and the Wii nunchuk is Link's shield, letting him move and bash away with "natural movements. The same natural movements are involved with the other items - you hold the nunchuk and Wii Remote like you would hold a bow and arrow, and you can either throw bombs overhead or roll them along the ground in a bowling motion. And Link was getting his Simon Belmont on with a whip. The presentation is going on right now - more as we learn it. But new Zelda? Hell yes. This game looks gorgeous. Art style seems between Twilight Princess and Wind Waker. There were some technical difficulties that Miyamoto and his translator attributed to wireless interference, but he assured everyone that the game would work perfectly when it was playable on the show floor. Skyward Sword is scheduled for next year. Greg Tito has more from the Nintendo E3 conference.